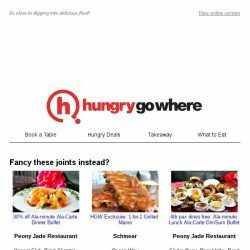 [HungryGoWhere] What’s for lunch? 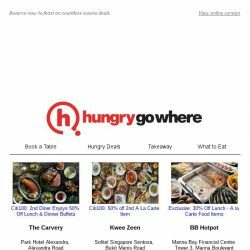 Savour delectable deals on 1-for-1 lunch buffet, 60mins mins express buffet lunch at $25.90++, and more! 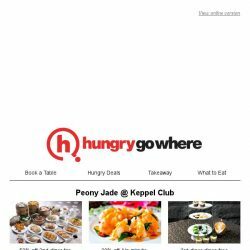 [HungryGoWhere] 4th Pax Dines Free on Dimsum/Buffet Dinner, 6-Course Peking Duck Set from $98 – Sumptuous Delights from Peony Jade! 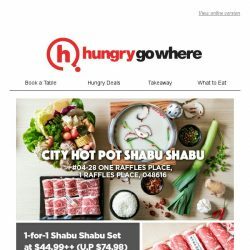 [HungryGoWhere] Savour the Tempting 1-for-1 and HungryGoWhere Exclusive Deals on Grilled Mains, Uni Chirashi, Buffet Dinner, and more! 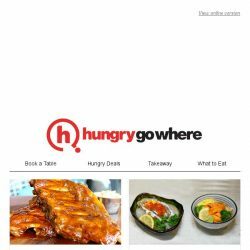 Till 31 Oct 2018 Dallas Boat Quay: HungryGoWhere Exclusive – 50% Off 2nd Steak! 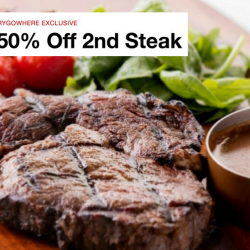 Exclusively to HungryGoWhere diners, Dallas Restaurant and Bar is offering 50% Off your second steak order! 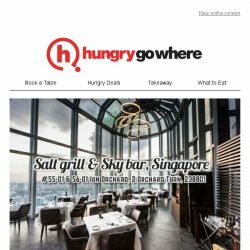 Located next to the Singapore River, they have a Level One Bar with a breezy alfresco area, a luxurious Level Two Restaurant, and an exquisitely appointed Third Floor VIP Lounge that boasts a private bar, a plush interior, and a balcony with gorgeous views of the river and the city skyline. 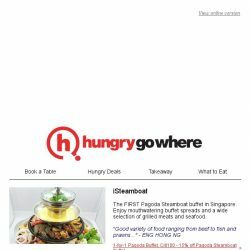 [HungryGoWhere] Fill your tummy and shopping bags this GSS with 1-for-1 pan roast chicken leg, 50% off 2nd lobster, and more! 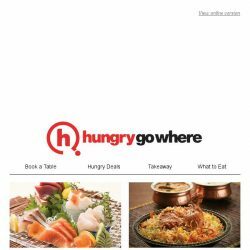 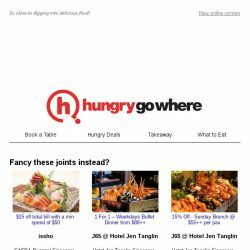 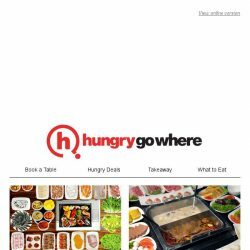 [HungryGoWhere] Exclusive Dining Treats for Singtel Customers: 1-for-1 Mains/Pizzas/Waffles, 30% Off Total Bill, and More! 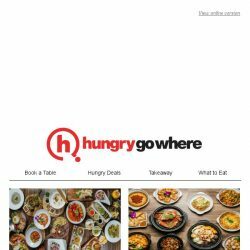 Till 31 Jul 2018 Morganfield’s: Enjoy 20% OFF Total Bill via HungryGoWhere! 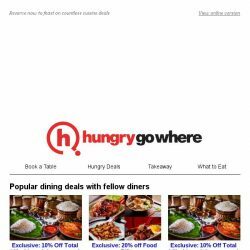 From now till end of July, Morganfield's Orchard Central is offering all HGW Diners an exclusive promo of 20% off your total bill! 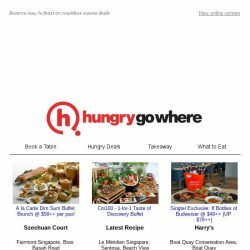 Only at this outlet are diners able to enjoy the highest craft beer garden along Orchard Road that pours 10 craft beers from all around the world on tap. 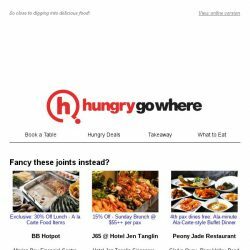 Definitely an excellent complement to its mouth-watering Signature dishes such as Sticky Bones! 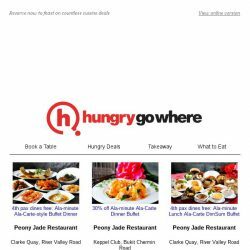 So make a booking through HungryGoWhere's website/mobile now to enjoy this deal! 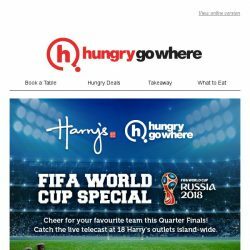 [HungryGoWhere] Catch 2018 FIFA World Cup Live at Harry’s – Enjoy 8 Bottles of Budweiser for the Price of 5! 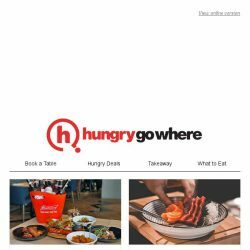 [HungryGoWhere] Get your last minute Father’s Day booking done! 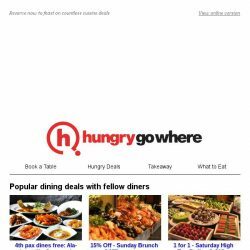 Dad dines free with 3 paying diners, 50% off buffet lunch/dinner for dad, and more! 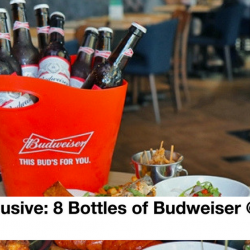 Till 31 Jul 2018 Harry’s: Enjoy 8 Bottles of Budweiser @ $49++ (UP $78++) for Singtel Customers! 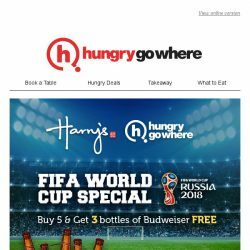 Catch the most anticipated 2018 FIFA World Cup Russia and enjoy 8 Bottles of Budweiser for only $49++ at any Harry's outlets (except Changi Aiport)! 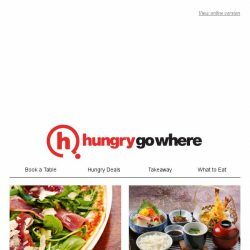 Book now on HungryGoWhere before 31st July 2018 to enjoy this deal! 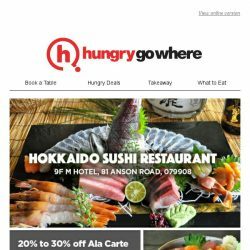 [HungryGoWhere] Our foodies’ favourite restaurants – 4th diner dines free buffet dinner, 20% off ala carte Japanese buffet, and more!